Kevin Durant’s 6th signature shoe was one of the most unique hoops shoes of the year, from the materials and technology to the construction of the shoe itself. 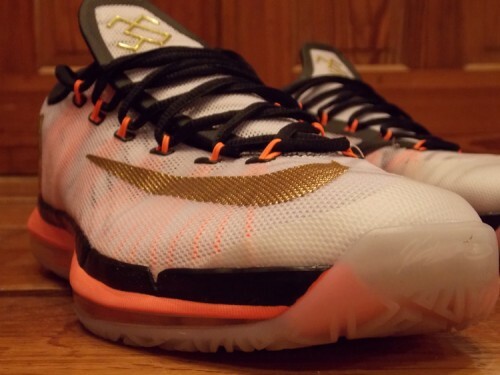 The Elite version of the KD VI, put a premium spin on those characteristics (along with a premium price tag). Featuring a full-length 360 Zoom bag, Hyperfuse and foam-based upper and Kevlar-reinforced Dynamic Flywire, the KD VI Elite packed about as much new technology as possible into one shoe. Unfortunately for a lot of hoopers, the tech-heavy shoe won’t hold up on the performance end. For full disclosure, I have a narrow foot and the width of your foot is going to have a big impact as to how well the KD VI Elite (or KD VI for that matter) fits. For me the fit was awful, plain and simple – it was the most unsettling shoe I’ve ever played in. I was afraid to plant and cut at full speed, and that is unacceptable in a performance shoe. That probably sounds harsh, but there are a number of reasons why I couldn’t get comfortable playing in the shoe. I don’t have a problem with low tops, in fact its my preferred type of shoe to hoop. 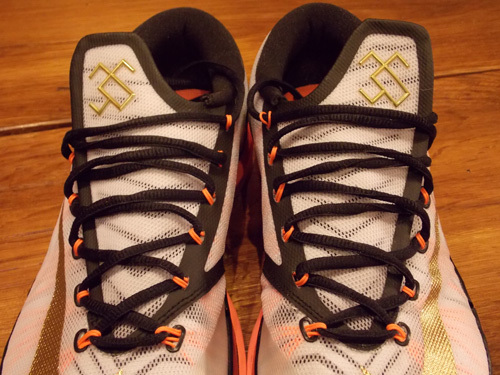 The height of the KD Elite VI didn’t bother me as much as the fact that the eyelets don’t go high enough up the foot to lock you in. The top eyelet is across the top of your foot, but is not adequate as far as pulling the collar/heel of the shoe securely around your foot. Besides the lack of eyelets, lockdown via lacing is impossible to achieve thanks to the use of Dynamic Flywire as the primary means of holding the upper to your foot. Yes, the innovative tongue that wraps the foot helps some but there’s an inherent amount of volume and width on the interior of the shoe and Dynamic Flywire is not enough to keep the upper secured to your foot. At this point, I could do without Dynamic Flywire in my shoes. 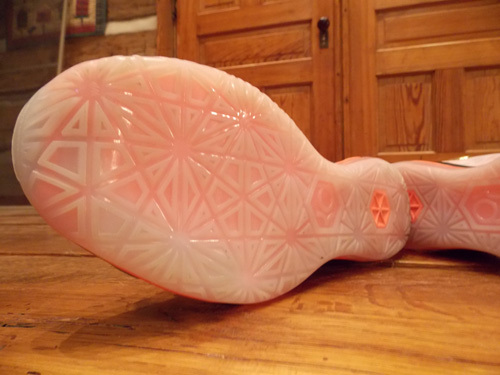 It’s not sturdy enough to lock down the foot on its own – even in the HyperRev, which had a softer foam/Fuse upper, it wasn’t enough to make me feel secure – and in my opinion is only useful as a reinforcement to the upper. Now, if you have a wider foot the fit may be different as your foot may take up more room in the upper. If this is the case, you might be able to get the lockdown you need. I had a buddy with a significantly wider foot try them on and put a few shots up in them, and he thought the fit was fine. For me though, there was way too much room around the collar area and I could not lace the shoe up even close to as tight as they needed to be. From there, my foot slid around all over the shoe. Several times on hard lateral cuts I found myself sliding over the edge of the footbed or slipping side to side in the heel. 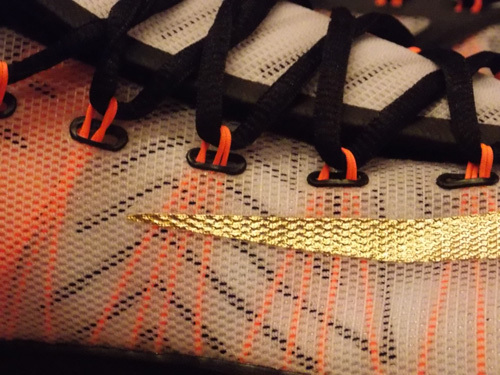 Perhaps with a softer or thinner upper the Flywire would secure the foot better, but it was a complete failure in the KD VI Elite. Even a wide-footer will still have issues with lacing lockdown and containment. 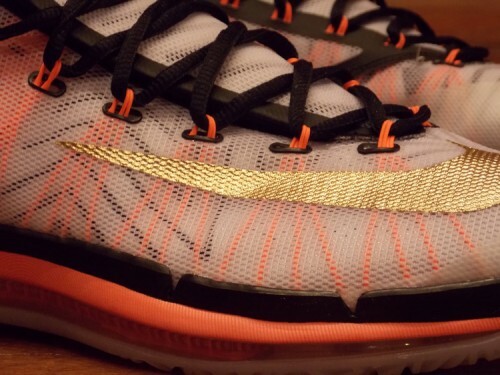 Another note – lace pressure is pretty bad in these as well. I typically hoop in Elites, and even in extra padded Hyper Elites the lace pressure across the top of the foot was annoying. The heel-toe transition was very good thanks to the continuity and sculpting of the 360 Zoom bag. There was no slap from heel to toe, and flexibility was adequate even with the high volume bag. Combined with the responsiveness of the Zoom bag, heel-toe transition was one of the bright spots of the shoe. 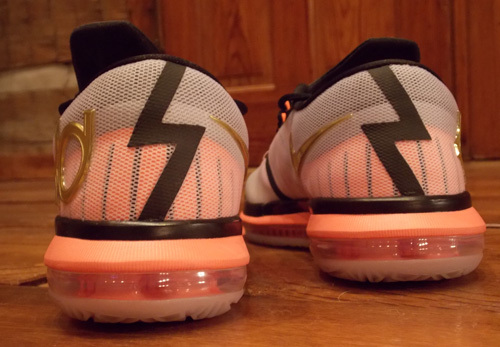 When I first put the KD VI Elite on, I said to Finch that this feels like $200 worth of cushioning. Besides being firm yet comfy, super responsive, supportive and low to the ground, the 360 Zoom setup is simply one of the best cushioning setups across the board. It’s not quite as responsive as the Flight Plate-aided setups in the Melo M10/XX8 and related models, but it’s very good. I always feel that a good Zoom bag strikes a perfect balance between being firm and plush, and the 360 Zoom is perfect in that sense. The shoe also plays fairly low to the ground despite having a full volume bag, though the stability is ruined by the fact that the upper doesn’t contain the foot over the footbed at all. Think of it this way – the KD VI Elite cushioning is perfect in a linear sense. In a straight line, walking or running, it’s going to feel like one of the best things you’ve had on your feet. Try to move laterally though, and it’s a different story. The lateral containment is bad thanks to the poor fit, and it combines with a full length Zoom bag to make lateral stability an issue. The midsole doesn’t wrap up around the foot much and that’s why a 360 Zoom bag can hamper lateral stability a bit. 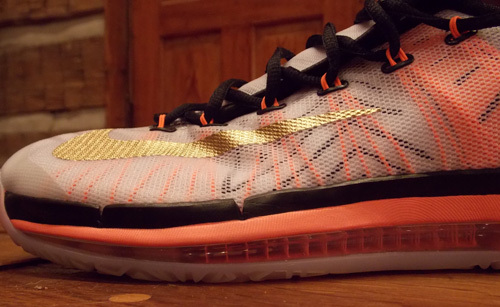 If you’re looking for pure comfort, the 360 Zoom midsole of the KD VI Elite is tough to beat. Unfortunately the poor lockdown and fit kills the playability of the shoe. The translucent rubber outsole features a geometric, storytelling pattern, but it provides better traction than I initially expected. On good floors you’ll get the familiar squeak on quick stops, and the shoe’s flexibility and relatively deep outsole grooves do a good job of stopping you on a dime. Being an Elite model, you’ll get all the latest tech and premium materials that Nike has to offer. 360 Zoom, Hyperfuse, Dynamic Flywire, etc. – it’s all there. I’m not sure if it’s $200 worth of materials (though you can seem to find colorways on sale already) but at least you’re getting the latest stuff. It doesn’t necessarily perform all that well on court, but as far as materials are concerned the quality is high and I don’t have a ton of durability concerns. The tip of the toe is reinforced against toe drag and I think the build is very good. For all the flashy tech, the KD VI Elite simply couldn’t get the basic requirement of good performance shoe down: a secure fit. Some players with a wider foot may find that it fits better through the upper than I did, but the poor lacing setup is going to be an issue no matter what. The cushioning is excellent, and traction, transition and material quality are all very good. Despite that, the fit is so sloppy that it makes the shoe tough to play in. I didn’t feel confident going all-out, full speed in the shoe and that makes it tough for me to play in. Still, I liked the shoe to a certain extent. 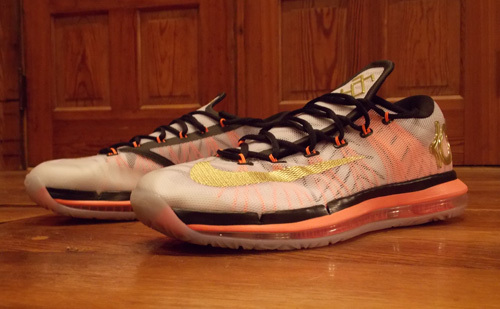 The KD VI Elite is extremely comfortable and miles better than last year’s KD V Elite. I just wish Nike would have refined the shoe a little more, rather than just dumping all the latest tech into it. The other point to be made here is value and price. At $200, this shoe is a large investment no matter who you are and I expected it to perform at a higher level. on the other hand, they do look good..
Yeah I mean there are some good things about it, but the fit is so bad – can’t really fix that. At least they’re comfortable off court and look good for a summer shoe, but that’s a lot to pay for that! Hmmm… weird i have a narrow foot and went true 2 size with these and they fit perfect. Cool man but can I ask you a question? What do you prefer more the Zoom bag on the KD 6 Elite or Full Length Lunar foam? I like full length Zoom better – when it’s fully encased. Lunar foam is a more consistent feel to me but it wears out too quickly and I feel like it loses responsiveness and impact protection. The 360 Zoom bag is really comfortable, but in the KD VI Elite I felt like it wasn’t stable enough laterally. Really, I don’t prefer either of those setups but I’d take Zoom over Lunar. The best full-length Zoom was in the the old Zoom BB line, especially the Zoom BB2. HyperRev was really nice too though.